Following his course of training, Siner appeared in many plays, working with repertory companies at a variety of theatres including Coventry, Leicester, Oxford and the Bristol Old Vic. He also did six major tours with the Cambridge Theatre Company, in mainly classic plays. He has also appeared several times in cabaret at The Ritz. Guy Siner was one of a number of actors from the TV comedy series 'Allo! 'Allo! 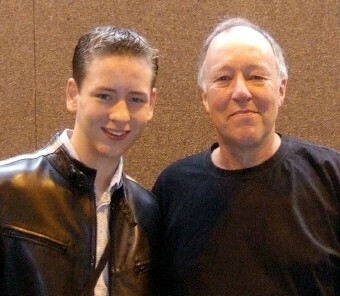 that I met at the Birmingham NEC in August 2006. He signed my first edition of The War Diaries of Rene Artois for me. Guy Siner was born in New York in 1947. His English mother wanted Guy to be educated in England so the family moved to the UK in 1952. Guy attended a prep school until he was 12, and then to Wellington College public school. After leaving school, Guy went to the Webber Douglas Academy in London, to study drama. Although well known in Britain for his theatrical and TV work, it was his 10-year stint in the long-running comedy series 'Allo! 'Allo! that has brought him worldwide fame since its showing in over 80 different countries. Siner appeared in a total of 83 episodes. Also, be sure to follow the link on the left to the 'Barry Beef' interview with Guy Siner - it is brilliant!! In 'Allo! 'Allo! Siner plays the German, Lieutenant Hubert Gruber, on leave from the Russian front. He is the rather 'camp' Tanks Corps officer, with a big crush on Rene, although his true sexuality is never admitted, only implied. Gruber's other 'love in his life' is his little tank. It is only in the final episode of the whole series that we discover that Gruber has married Helga Geerhart, and the pair had six children after the war! 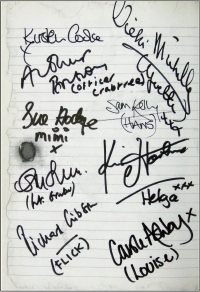 Siner also toured with the stage version of the show, including its five-week run in London's West End. Guy Siner's cousin was the actor Simon Cadell (d.1996) whose father-in-law, David Croft, is the co-writer and director of 'Allo! 'Allo! and many other UK TV comedies. Guy Siner is now based in London as both an actor and a writer/producer. His film appearances include Great Harry and Jane (1994), Leprechaun 4 (1997), Return to the Secret Garden (2000), Vlad (2003) and Pirates of the Caribbean (2003) with Johnny Depp. Guy Siner's other TV credits range from Z Cars (1972), Softly Softly (1973), Dr Who (1975), I Claudius (1976) and The Brittas Empire (1994) in the UK, to Seinfeld (1995), Babylon 5 (1997), Diagnosis Murder (1999) and Startrek: Enterprise (2002) in the USA. The FAQ page on Siner's website gives interesting info about his time in 'Allo! 'Allo! 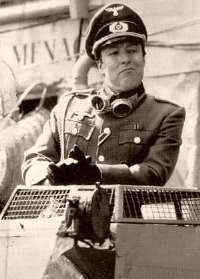 Lieutenant Gruber in his 'little tank' in 'Allo! 'Allo! 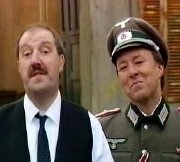 Guy Siner & Gorden Kaye in 'Allo! 'Allo!